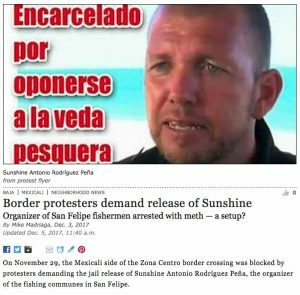 On November 29, the Mexicali side of the Zona Centro border crossing was blocked by protesters demanding the jail release of Sunshine Antonio Rodríguez Peña, the organizer of the fishing communes in San Felipe. Rodríguez was stopped by Mexican federal agents on November 25 when he was driving with his family from Mexicali to San Felipe. He and his wife, Sara, were detained when they “found liquid methamphetamine” in his vehicle. La Cronica, a Mexican news outlet, said that the protesters blocked the streets at 11:50 a.m. for about an hour. The large protest made clear the extent of the problem for fishermen in the upper reaches of the Gulf of Mexico. 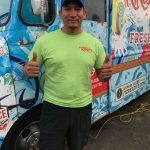 Rodríguez was stopped by Mexican federal agents on November 25 when he was driving with his family from Mexicali to San Felipe. 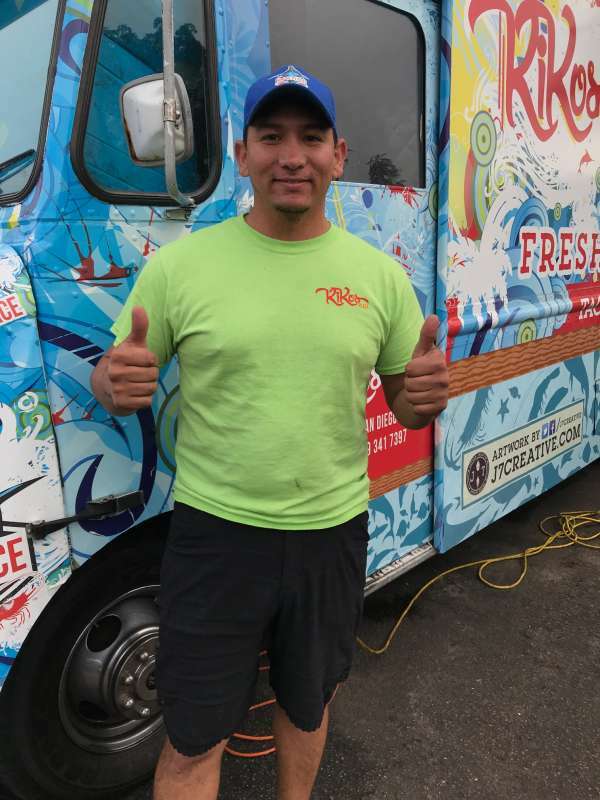 “The fishermen from San Felipe are protesting the government’s [ban of fishing],” said Javier Escamilla, “because [the government] wants to save the vaquita [porpoise].” Escamilla, the owner of Kiko’s Place seafood trucks located at 4404 Texas Street, is a third-generation food-business owner and fisherman who still visits his family and friends back in San Felipe. “My family has been there since [before] 1960,” he said. Many of the protesters believe that Rodríguez was “set up” and expressed such at their libren a Sunshine protests, which also took place at the airport and the PGR (Procuraduría General de la República), the attorney general’s office in Mexicali. In April 2015, the Mexican government placed a two-year ban on gill-net fishing in the vaquita habitat, which is in the northern part of the Gulf of California, by San Felipe. Animal activists estimate that there are less than 30 vaquitas left, and in July 2016 a permanent ban along with a ban on night fishing was implemented. Escamilla said the fishermen each receive approximately 2500 pesos (about $134) a month. 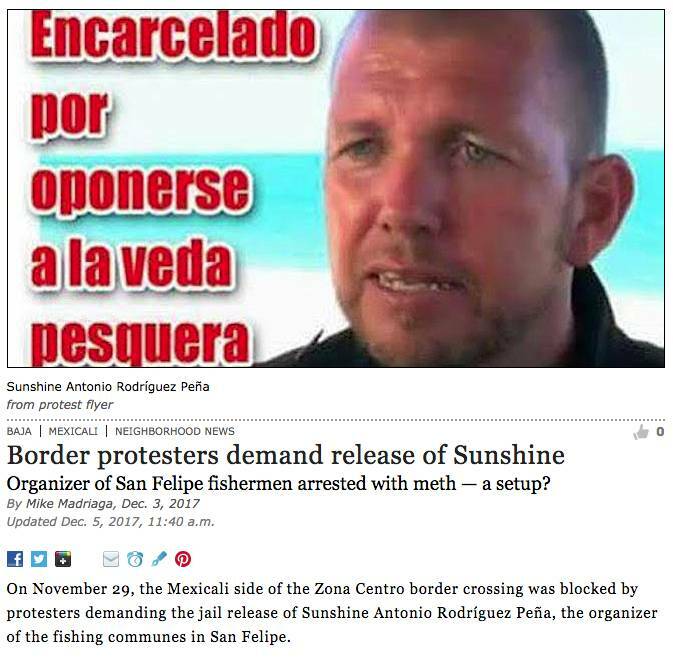 Escamilla said that they “can’t even fish with poles” and because of the fishing prohibition, the government compensates the [San Felipe and the Gulf of Santa Clara, Sonora] fishermen with money. Escamilla said the fishermen each receive approximately 2500 pesos (about $134) a month. Others are resorting to poaching, including the totoaba, a large endangered species of fish desired for its bladder, which is in high demand by the Chinese for its healing properties. Rafael Pacchiano Alamán, Mexico’s environmental secretary, said there were complaints about Rodríguez’s “illegal fishing of the totoaba” in a Televisa interview. Gill nets are used to capture the totoaba and in doing so, the fishermen also catch other species, including whales, dolphins, and the vaquita porpoises. Escamilla added that the San Felipe fishermen protests will continue. “They are going to keep blocking [the roads] until they hear something from the government and let him go,” he said. Reports say that Rodríguez and his wife were sent to Mexico City on the Sunday after they were arrested. UPDATE: Sunshine Antonio Rodríguez Peña was released from jail on Sunday, December 3rd.